A 26-year-old hairdresser is celebrating after what she thought was a $1,000 winning lottery ticket turned out to be worth a staggering $1.3million. Ligia Dennis was waiting for her clothes to finish washing at a Laundromat in Los Angeles, California, when she decided to buy a coffee from a donut shop across the street. While there, she also purchased three $6 California Lucky Life Scratchers tickets on the spur of the moment, two of which she later gave away to her mother and brother. After a homeless man asked her for change, she nearly handed over her final ticket to him, but decided against it at the last second, her fiance, Tim Ballany, told CBS Los Angeles. When Miss Dennis discovered she was in possession of a winning ticket, she was ecstatic. 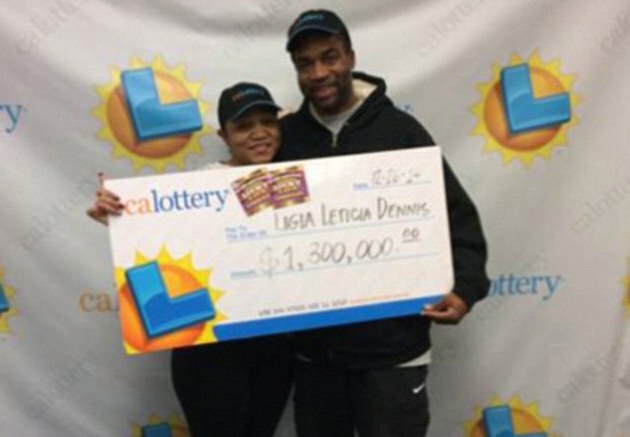 However, she initially did not realize the extent of her win – thinking she had scooped $1,000. It was only when she traveled to the California Lottery Van Nuys District Office on December 26 that she found out she had actually won $1,000 per week for 25 years – a total of $1.3million.